Whether you’re running an alternate full site restore or you’re just trying to restore a single file, there are multiple things that need to go right in order for the restore to be successful. This post is to help make those different pieces fit together to make your restore a success. The first half will cover tips for before you run a restore and the second half will cover troubleshooting steps based on errors you may run into. Make sure your site is publicly accessible. VaultPress can’t restore your site if it isn’t publicly accessible. If your site is down and you’re trying to restore it, your best bet is to install a fresh WordPress installation, install & register VaultPress, and restore from there. If you’re unsure what this entails, you can contact your host for help! Otherwise, check out this page in the Codex from WordPress.org that explains the proper set up. VaultPress needs full access so that it can properly add files to your directory. If it can’t, you’ll run into issues restoring. If you don’t do this, you may find that you are unable to log-in to your new site, or that you are unable to update plugins. If you run into problems, please do reach out to us. We can’t restore your site to a different location if there isn’t a WordPress installation there and if it isn’t publicly accessible. Check out these sets of posts that covers our pre-flight checks for your WordPress database user. 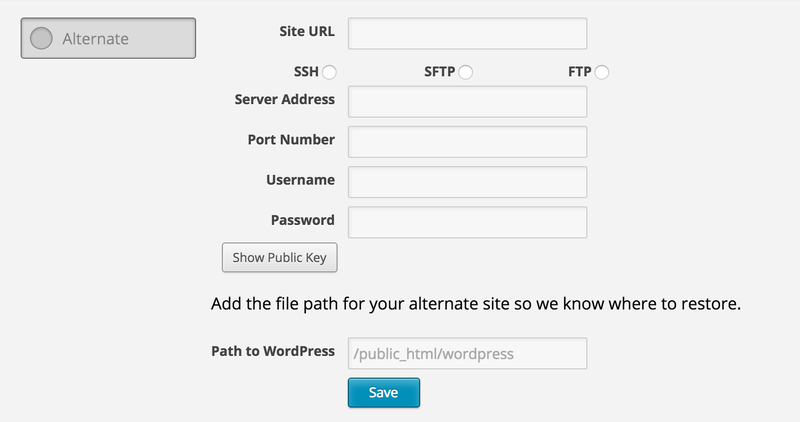 Your WordPress database user can be found in your wp-config.php file and it needs to have certain permissions in place for VaultPress to restore your site. The following posts link to next steps to take after you run into a failed restore. If at any point you need help though just contact us. We’re here to help get your site back up and running!